Clearwater – 27232 US Hwy 19 N.
Pinellas Park – 5890 Park Blvd. Tampa – 3902 S. Westshore Blvd. Tampa – 501 E. Sligh Ave.
Tampa – 7901 West Hillsborough Ave.
Zephyrhills – 6609 Gall Blvd. Seven months after joining the Ice Cold Air® family as a manager, Nick Zammit is now the owner of his location. Originally born in Buffalo, Nick moved to the Clearwater area in 1994 and graduated from Dunedin High School. He has always loved cars, so it’s no surprise he ended up in the auto industry. He has made cars his living since 2005. He enjoys spending time with his beautiful little girl who he says, “brighten my days.” He is also the proud papa of fur babies, Pedro (a Dachshund) and Reese (Boston Terrier-Chihuahua). 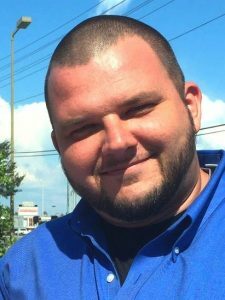 Seven months after joining the Ice Cold Air® family as a manager, Nick Zammit is now the owner of the Port Richey location (11930 US Hwy 19N @ SR 52). Originally born in Buffalo, Nick moved to the Clearwater area in 1994 and graduated from Dunedin High School. FREE OIL CHANGE & COURTESY CHECK! Don’t need an Oil Change now? NO PROBLEM! How about a $20 Gift Certificate toward any Repair or Maintenance? Donate $15 Worth of School Supplies! 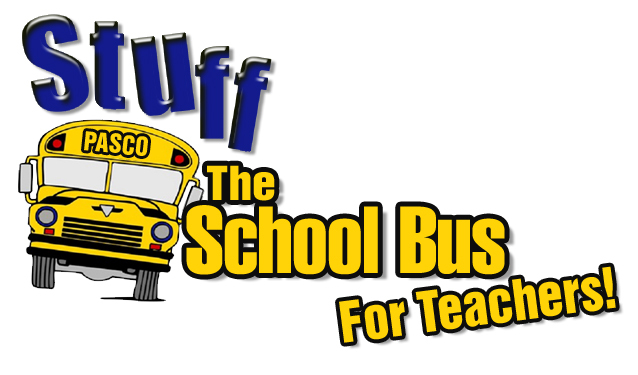 WE ARE COLLECTING DONATIONS FOR STUFF THE BUS! All great offers come with a catch! Here’s the deal: All you have to do is purchase new school supplies (worth $15 or more please), and donate them to our Stuff the Bus School Supplies Drive and we will give you a FREE OIL CHANGE or $20 Off Your Next Repair or Service. It’s that Simple! HURRY! Limited Time Offer on a FREE OIL CHANGE with Donations!!! Call for your appointment, as our schedule is sure to fill up. Ice Cold Air Awarded Best Honest Mechanics in a Dishonest World!! Wow are we excited! 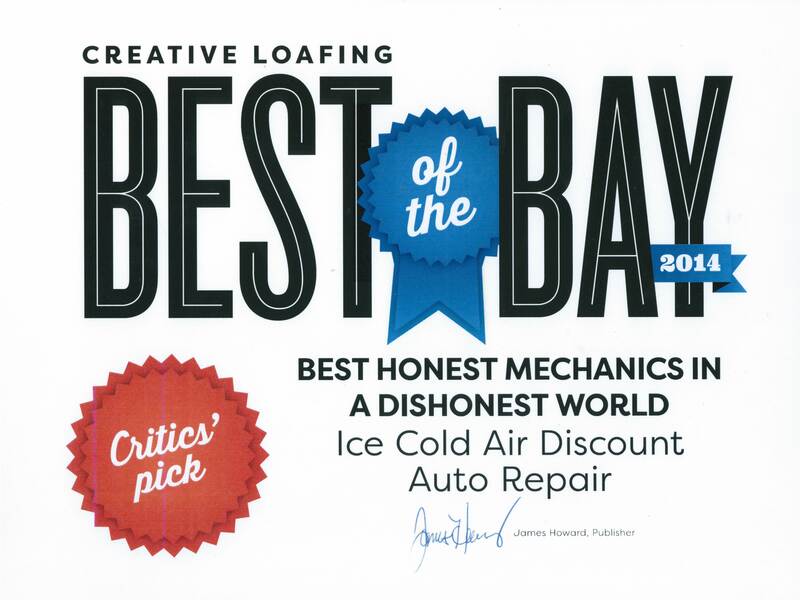 Ice Cold Air Discount Auto Repair was presented a 2014 Best of the Bay Award from Creative Loafing. Thank you to Creative Loafing for recognizing how hard all of us work to make our wonderful reputation stronger every day, and thank you for telling all of your readers throughout the greater Tampa Bay area too. We would like to convey our heartfelt congratulations to each and every shop, and each and every employee who share in this tremendous acknowledgment. It is a true testament to how far we have come together as a team to make our Ice Cold Air family stronger and our company thrive in the spotlight of greatness. 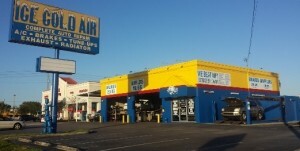 Disclaimers: Ice Cold Air ® Discount Auto Repair locations are independently owned and operated. Prices and Services may vary based on location. Specials, or coupon offers are available at participating locations only.